I feel like fall is the season of caramel corn. And kettle corn. And simply, buttered popcorn. Or any of the above happening in front of a fire on a cold night, snuggled under a blanket, binge watching Scandal season 4. My favorite kind of Saturday night! (Introverts unite!) In truth, I don’t make caramel corn any other time of the year, not since my first time. 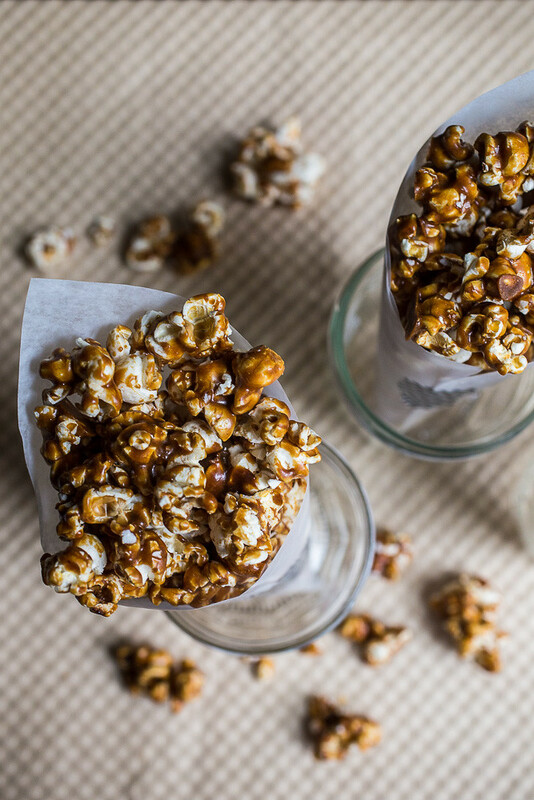 It might have to do with the need to be tethered to a low oven for almost an hour, tossing, tossing, tossing, to ensure the popcorn is evenly covered with the deep amber molten caramel. And since I’m unwilling to give up my time during daylight hours to do this, the early darkening skies this time of year works nicely. You may remember last year when I taught my mom how to make caramel corn, some of which ended up in these caramel corn brown butter cookies. We made a double-batch of caramel corn that night which I had planned to bring to work the following day and it took us every bit of two hours with two ovens going. But some things are worth the work. This is one of them. 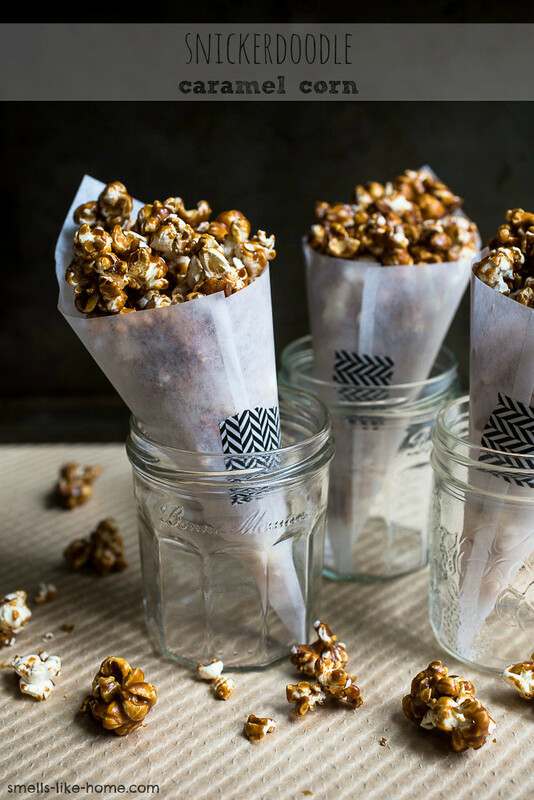 When the craving hit to make caramel corn last weekend I decided to mimic a version I found at this adorable popcorn shop Annie took me and Josie to when we visited in September. (Also, all hail the popcorn shops of the world!) The choice was not an easy one but I ended up with snickerdoodle caramel corn and a half caramel-half cheese version (side note: had any of you tried Angie’s BOOMCHICKAPOP’s version? O.M.G.). The snickerdoodle was outstanding – so much so that I vowed to make my own version. And here it is. 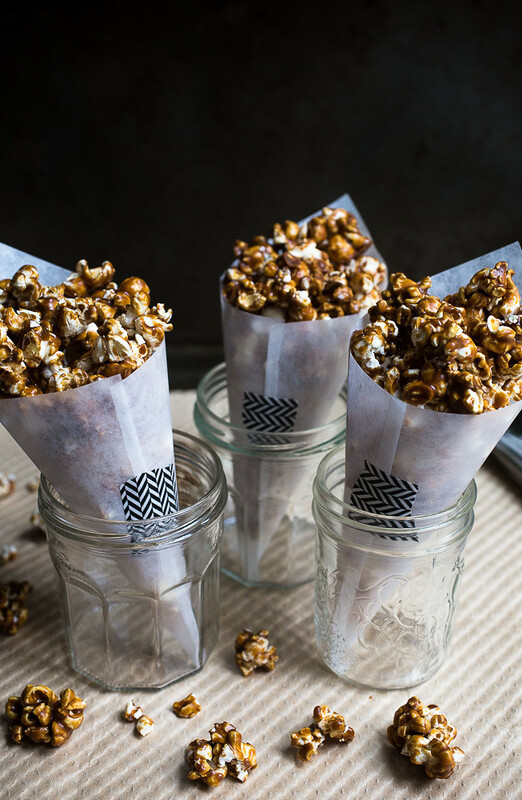 Simple cinnamon-y snickerdoodle caramel corn: deeply flavored, rich dark amber colored, perfect crunchy, and insanely addictive. I have a few other caramel corn ideas floating around in my brain that stem from this snickerdoodle version and I hope they work as awesomely as this one does. Pop popcorn using your preferred method. Place the popped popcorn in two very large bowls. Make sure there is enough room in your bowls for tossing the popcorn. Preheat the oven to 250° F. Line four large baking sheets with parchment paper. To make the caramel: Melt the butter in a 2-quart saucepan set over medium heat. Once the butter is melted, mix in the corn syrup, brown sugar and salt. Increase the heat to medium-high and bring the mixture to a boil, stirring frequently. Once the mixture reaches a boil, let it continue to boil for 5 more minutes without stirring. If the heat is too high and it looks like it the pan may bubble over, reduce the heat rather than stirring the caramel. Remove the mixture from the heat, stir in the baking soda, cinnamon, and vanilla extract. The mixture will bubble up and become frothy. Pour the caramel sauce over the popcorn in the bowls and toss to coat thoroughly. Salad spoons work great here! Bake for 40-50 minutes, removing from the oven to toss/stir every 10 minutes. After 40 minutes, test a cooled piece of popcorn. If it is not completely crispy (i.e. still slightly mushy when you bite it), bake for 10 minutes more. Transfer the baking sheets to a wire rack and allow popcorn to cool completely before breaking apart for serving or packaging. Popcorn will keep nicely stored in ziptop bags for 1 to 2 weeks. Melt the butter in a 2-quart saucepan set over medium heat. Once the butter is melted, mix in the corn syrup, brown sugar and salt with a rubber heatproof spatula. Increase the heat to medium-high and bring the mixture to a boil, stirring frequently. Bake for 40-50 minutes, removing from the oven to toss/stir every 10 minutes. After 40 minutes, test a cooled piece of popcorn. If it is not completely crispy (i.e. still slightly mushy when you bite it), bake for 10 minutes more. Transfer the baking sheets to a wire rack and allow popcorn to cool completely before breaking apart for serving or packaging. Popcorn will keep nicely stored in ziptop bags for 1 to 2 weeks, at least.